What I find interesting in researching Nile exploration is the synonymity between field science and colonial warfare present in Sudan during the 1880s and 1890s. This map, taken from an 1885 issue of Science, is from a report by C.P. Stone on the unfolding siege of Khartoum. A Civil War veteran, Stone (along with a hundred other veterans) were invited by Egypt to train its military. Stone stayed in Egypt until the 1882 Urabi Revolt and the subsequent bombardment of Alexandria by the Royal Navy. In 1884 and early 1885, Charles Gordon was besieged in Khartoum, his force surrounded by the Mahdist rebels. On Jan. 26 1885, the Mahdist took Khartoum. Using his experience as a springboard to speak authoritatively on matters of geography, Stone speaks about Khartoum’s fall by providing an overview of Sudan’s geography between the Nile and the Red Sea. 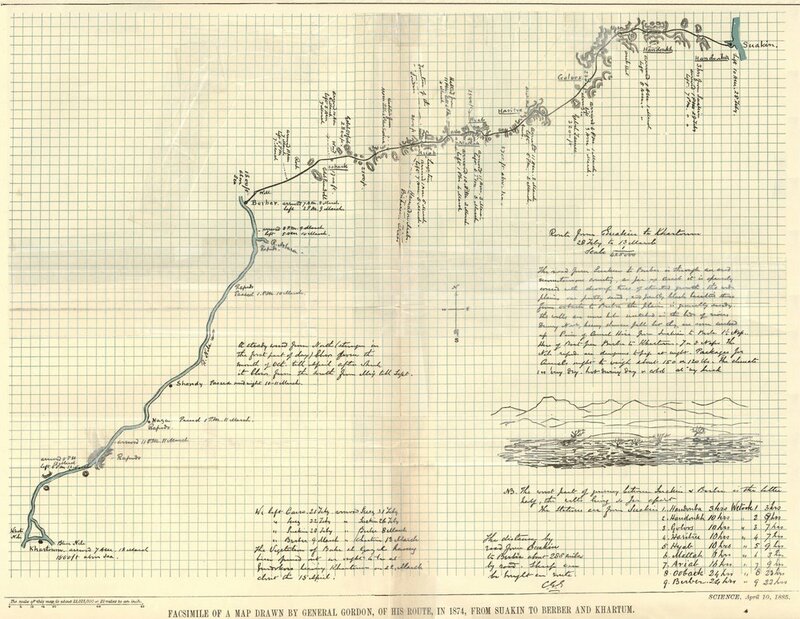 With an attached copy of Gordon’s 1874 map of the region, Stone speaks to the logistical issues facing any mission to avenge Gordon’s death. But why was this published in Science? Given that this same issue of Science would extol Gordon’s scientific credentials by citing Gordon’s military prowess, I have questions on how Americans viewed the relationship between scientific thinking and military skill during the 1880s and 1890s. citation: CP Stone, "The Route from Suakin to Berber," Science 5, no. 114 (10 April 1885): 290.